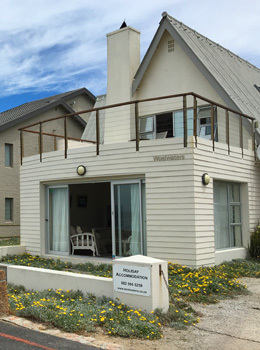 Woelwaters, the ideal family getaway, is situated on the beach front at Onrus, a small village on the Southern Cape coast a mere hour's drive from Cape Town International Airport. Here you can relax in comfortable beach house style, while watching southern right whales frolicking in Walker Bay from your patio. Indulge in the tranquil views of the Onrus lagoon, a haven for many bird species and the occasional Cape clawless otter. This part of the coast is a well-known holiday and whale-watching destination. The house is literally a stone's throw away from the beach, and located at one of the more popular surfing spots in the area. The Onrus lagoon is a safe haven for little ones, while the surf provides the adrenalin rush for those who need it. Immaculately maintained, Woelwaters is an inviting family home that can accommodate a big family group or group of friends with ease and comfort. You have the options of renting the main house only for a group of up to seven persons; or the main house plus the annex, sleeping 11 in total. Great care has been taken to ensure your privacy and enjoyment of the surroundings.